Anderson, Judith Icke (1981). William Howard Taft: An Intimate History. New York: W. W. Norton & Company. ISBN 9780393014624. Anthony, Carl Sferrazza (2005). Nellie Taft: The Unconventional First Lady of the Ragtime Era. New York: William Morrow. ISBN 9780060513825. Bromley, Michael L. (2003). William Howard Taft and the First Motoring Presidency. Jefferson, North Carolina: McFarland and Company. ISBN 9780786414758. Burton, David Henry. William Howard Taft: Confident Peacemaker (St. Joseph's University Press, 2004). Burton, David H. "The Learned Presidency: Roosevelt, Taft, Wilson." Presidential Studies Quarterly 15#3 (1985): 486-497. Burton, David H. (1998). Taft, Holmes, and the 1920s Court: An Appraisal. Madison, New Jersey: Fairleigh Dickinson University Press. ISBN 9780838637685. Burton, David H. (2005). Taft, Roosevelt, and the Limits of Friendship. Madison, New Jersey: Fairleigh Dickinson University Press. ISBN 9780838640425. Chace, James (2004). 1912: Wilson, Roosevelt, Taft and Debs – The Election that Changed the Country. New York: Simon and Schuster. ISBN 9780743203944. Conner, Valerie (1983). The National War Labor Board. Escalante, Rene R. The Bearer of Pax Americana: The Philippine Career of William H. Taft, 1900-1903 (New Day Publishers, 2007). Frank, John P.; Leon Friedman; Fred L. Israel, editors (1995). The Justices of the United States Supreme Court: Their Lives and Major Opinions. Chelsea House Publishers. ISBN 978-0-7910-1377-9. Gould, Lewis L. (2010). The William Howard Taft Presidency. Hechler, Kenneth S. (1940). Insurgency: Personalities and Politics of the Taft Era. Hicks, Frederick (1945). William Howard Taft, Yale Professor of Law & New Haven Citizen. New Haven: Yale University Press. Korzi, Michael J. (2003). 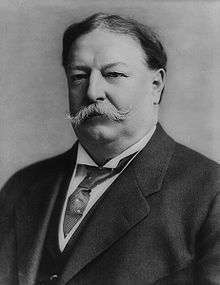 Our chief magistrate and his powers: a reconsideration of William Howard Taft's "Whig" theory of presidential leadership. Manners, William (1969). TR and Will: A Friendship that Split the Republican Party. Minger, Ralph E. (1975). William Howard Taft and United States Diplomacy: The Apprenticeship Years. 1900–1908. Mossman, Billy C.; Stark, M. W. (1971). "Chapter II, Former President William Howard Taft State Funeral 8–11 March 1930". The last salute : civil and military funerals, 1921-1969. Washington, DC. Morrisey, Will. The Dilemma of Progressivism: How Roosevelt, Taft, and Wilson Reshaped the American Regime of Self-government (Rowman & Littlefield Publishers, 2009). Solvick, Stanley D. (December 1, 1963). "William Howard Taft and the Payne-Aldrich Tariff". Mississippi Valley Historical Review. 50 (3): 424–442. doi:10.2307/1902605. ISSN 0161-391X. JSTOR 1902605. Warren, Charles (1928). The Supreme Court in United States History. 1. Boston: Little, Brown, and Company. Wilensky, Norman N. (1965). Conservatives in the Progressive Era: The Taft Republicans of 1912. Liberty Under Law. New Haven: Yale University Press. 1922. Our Chief Magistrate and his Powers. New York City: Columbia University Press. 1916. Popular Government. New Haven: Yale University Press. 1913. Present Day Problems. New York City: Dodd, Mead and Company. 1908. The Anti-Trust Act and the Supreme Court. New York City: Harper & Brothers. 1914. Burton, David H., ed. (2001–2004). The Collected Works of William Howard Taft. Ohio University Press (8 volumes). Taft, Mrs. William Howard (1914). Recollections of Full Years. Bibliography of William Howard Taft at the Biographical Directory of Federal Judges, a public domain publication of the Federal Judicial Center.